This time last year, I was about to begin my first paid job as a university lecturer in two years, and was moving back to the UK to do so. I was VERY pleased. I’d been a university researcher and lecturer in Belgium since 2006, and finally I had a job in a British university, back in the system that trained me how to read and think. But it was a short-term teaching cover contract, and as the end date approached, something changed. I didn’t want to teach any more. My research ideas did not fit the approved topics. I didn’t think much of British academic rigmaroles. I could only see ahead, down a path I’d chosen ten years before and was still hoping that the magical door to a permanent post would open. I’d battled a lot of demons to get this far. But I was slowly realising that those doors were being kept closed by powers I could not influence. What got me out of this rut was a casual remark by a friend and colleague who knows me well. ‘You should start a publishing company.’ That was on a Friday in March, on which I’d managed an international workshop. The best parts of the workshop were hearing about the research that was going into a wonderful book on a fascinating subject that no-one had worked on before, and I was more enthusiastic about editing it than my teaching in the next week. And still I went home on Friday night thinking, ‘I could never run a publishing company’. By Sunday night I was busily planning how it would run, what it would publish, what it would be called, and pulling in opinions from my vast publishing-related network to see if I was mad or just over-ambitious. I have a vast publishing-related network, because before I was a university lecturer, I was an editor, in trade publishing and in the civil service. All my career has been about discovering stories to tell people about. As an editor, as a researcher, as a lecturer, as a book reviewer, and now as a publisher. There is no career change here, it’s just a new label for the same passion for stories. I’d done most of the jobs that publishing could offer. I used to correct layouts with SprayMount and chinagraph blue, and work on text the newfangled way in WordStar, in yellow Courier on a tiny black screen. I think the technology behind distribution networks is the most changed, and ebooks and digital media are of course a whole new area. Technology makes the work faster, easier, more flexible and massively more ingenious. Publishing is still fun. I am completely happy as a commissioning editor and as a proof-reader. I have rediscovered my enthusiasm for interfering with cover layouts, and I am picture researching again. I can talk to printers in their own language, even if I can’t understand what my accountant says. But that’s where I am very, very lucky. My husband is the other director of Handheld Press, and he is a numbers man. Without him, none of this could possibly have happened, because I would have messed up the costings a long time ago. But most of the company is me. My life in research makes me a cunning sniffer-out of books that will work for Handheld, and my publishing background means that I know what I’m doing, even if it occasionally feels as if I’m racing along in turbulent seas with no landfall in sight. we’e going to the London Book Fair next year and we are a bit terrified. Networking at that scale is intimidating. I mean, I could NOT have imagined all of that if I’d been asked to, back in March. Maybe one or two of those things, but not all of it. I need to learn to close the office (ie close the laptop) and take more breaks. I need to crack the Amazon ebook system because it does my head in. I still don’t miss the teaching, but I need to start saying no to conferences: my past research projects seem to take a long time to get old. But on the whole, it has been a remarkable year. Stay aboard for the next year of wonders. 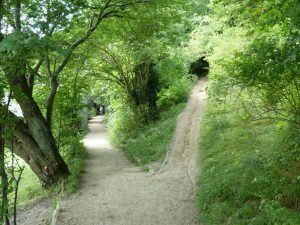 Photo of two diverging paths found on this site by a browser search.